In part one, we saw how Donald Watson, Leslie Cross and other founders of the word “vegan” and the Vegan Society implied and then stated what it means to apply the vegan principle to the rest of our lives and the vegan movement. Their evolving vision gives us an opportunity to reemphasize and expand on what veganism can do for all life and ecosystems. Here I describe why it is equally important to realization that many other issues must be solved if veganism is going to be the global norm. Remember what Leslie Cross of the Vegan Society said in 1951: “In a vegan world the creatures would be reintegrated within the balance and sanity of nature as she is in herself.” She gave this as an example of applying the “vegan principle” to areas other than dietary choices. So I ask, do issues like overpopulation and food not getting to people fit within the vegan principle, or do the vegan principle and veganism exist within a larger context? I believe it is clearly the latter. This was apparent in Donald Watson’s 2002 interview that I described in Part II. All the issues he mentioned fit within a larger context already in use, a place in which veganism and other subjects exist side-by-side and make sense as a whole. They live within the comprehensive context of our human ecology. Human ecology is the study of the relationships we create with our external environment. That external environment includes other people, our social institutions, individuals from other species, ecosystems—the entire Earth. We create those relationships with our behaviors, our personal and collective decisions and the institutions that organize our social existence—cultures, communities, governments, religions, and all manner of social organizing. As vegans we are in fact insisting on a new, updated human ecology because we are calling for a reformation of human behavior, attitudes, and beliefs that support veganism. As a result of this vegan behavior, a vegan human ecology, we have healthier, relatively nonviolent, and just relationships with our external environment. Vegan behaviors create relationships that are far different than those found in hunter, fisher, animal agriculture, and other violent exploitations. First, human ecology serves our movement when we see it not as a “study of” but as a tool. We are constructing an intentional new human ecology of veganized relationships. We are active builders, not passive reporters who study what we know is not working—our current human ecology of failed behaviors and relationships. Second, because it is all-inclusive, our new human ecology contains a multitude of other social movements and their issues under one roof. Human ecology is our common platform. It demonstrates how social movements and their concerns are interdependent. Please take a moment to study this new human ecology graphic. You may have to click on it to enlarge. It is here, within the broad and inclusive space of our new human ecology that we advocate for deep reforms in our relationships with all the individuals from other species, the people we cohabit with on Earth, and our shared ecosystems. Veganism alone is a revolution in human behavior and will define our species. While it is essential to our physical and moral survival, we will not grow it in time unless we make better use of its importance to all the other social causes shown in the illustration. In turn, veganism needs them to succeed if we are not to be defeated by their failures in spite of our work. We must initiate the discussion about reforming our human ecology when we talk to advocates from other movements about the necessity and reasonableness upon which veganism gently floats. There is, after all, only one problem and it is our human ecology. Within it is veganism, the healer. Once we see the characteristics of our intentional new human ecology, we understand that our vegan vision includes many co-evolving social movements. If we state that our current human ecology is no longer adaptive to our physical and moral survival, then by default we are saying we must solve many other monumental crises simultaneously. The strength of veganism is realized when other people and organizations see it is in their self-interest to adopt our issue as we often adopt theirs. From our perspective, we will not reduce the suffering of individuals from others species until human populations decline. From theirs, wildlife and plant communities in ecosystems will be lost unless the planet is freed from animal agriculture and the incessant over-populated invasion of humans into wildlife habitat. Social and economic justice advocates realize that impoverished ecosystems result in impoverished people. Nonvegans cause extinctions and impoverished ecosystems. It’s all connected. 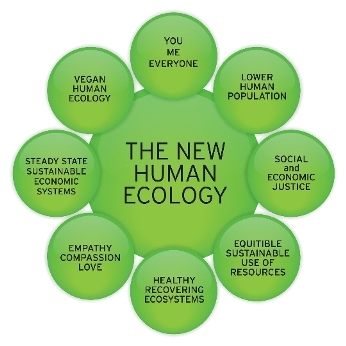 Also included in the new human ecology is the need to reform economic systems until they support social and economic justice, reflect the innate value of life instead of its commodification, and support the restoration of ecosystems. Otherwise, wildlife and people alike will suffer as ecosystems continue their collapse and loss of biodiversity. Only when vegans express the need to end socially destabilizing poverty for the poorest three billion-plus people on Earth will we see the political stability necessary to protect wildlife and equal rights for women that includes control over decisions regarding pregnancy. Armed conflicts threaten people and wildlife around the world. These conflicts often are caused by social instability and injustice characterized by food poverty. The cost of food rises because the poor compete with the wealth of animal agriculture that outbids them for grains and legumes like corn and soybeans. Each of these issues is connected by cause and effect to the others. In Part III of The Unlimited Vegan we will explore the specific examples that demonstrate why veganism and the other movements cannot be successful as stand-alone issues. This is the way of the future. Veganism is not a diet….it is a lifestyle or philosophy of life derived from Schweitzer’s Reverence for Life. Part of that lifestyle is a plant-based diet; a very important part, but still only a part. If we use dietary veganism as a litmus test for acceptance into the vegan biosphere, we will lose many potential future vegans, and we will not be able to ally with other social progress/advancing human evolution movements, which, as is pointed out in this article, is necessary. We should EMBRACE, not JUDGE AND REJECT. Eating a plant-based diet IS NOT ENOUGH.